Explore the famous landmarks and monuments of Washington, DC on this guided, 5-hour bike and walking tour. 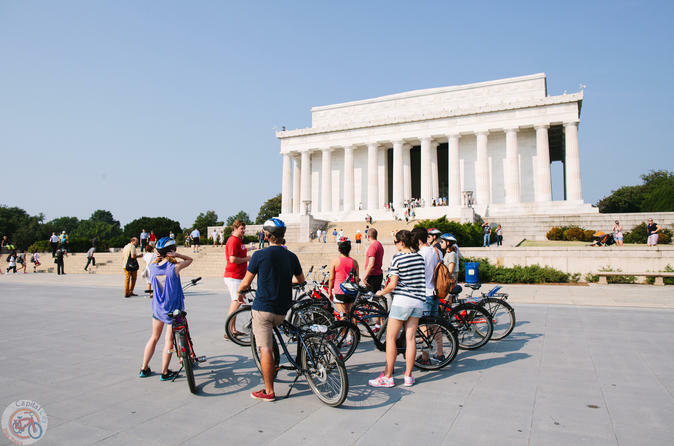 Pedal around and to the major monuments and memorials in the nation's capital. Travel through the National Mall, visiting the Thomas Jefferson Memorial, the Lincoln Memorial, the Franklin Delano Roosevelt Memorial, the Vietnam Veteran's Memorial, the Martin Luther King Jr. Memorial, and more. Then travel over Arlington Memorial Bridge to visit Arlington Cemetery. Along the way, hear historical facts, funny stories, and anecdotes from the guide. Helmet and bike are included. This 'Bike Tour of DC Monuments and Arlington Cemetery' begins at 502 23rd Street NW in Washington, DC. Meet and greet the tour guide and the rest of the group. Then gear up for the 9:30am ride with a comfortable helmet and bike. Travel through the National Mall, visiting some of its best memorial parks. See the Thomas Jefferson Memorial, the Lincoln Memorial, the Franklin Delano Roosevelt Memorial, the Vietnam Veteran's Memorial, and many more. After a brief stop for lunch (cost not included), pedal across the Potomac River, over the Arlington Memorial Bridge and into Virginia and Arlington National Cemetery, honoring those who fought for the United States. Bikes will be parked at the entrance before strolling across the hills of Arlington Cemetery to see Arlington House, the Kennedy Gravesite, and the Tomb of the Unknown Soldier, where the incredible Changing of the Guard will take place.